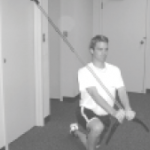 Standing wall drills are a great way to activate the gluteals, while focusing on posture and proper mechanics. Since you run with your whole body, not just your legs, you need to strengthen your whole body. The number one thing we find with most runners is a complete absence of upper body training. Two to three upper -sessions each week will maintain strength and reduce the risk of injury while you increase your mileage. Some exercises you should definitely include are dead lifts, pillar bridges, cable lifts, cable chops. Have you ever felt tightness along the outside of your thigh? That is your iliotibial band, a long tissue that attaches at your knee into a muscle called the tensor fascia latae (TFL) on your hip. When the TFL becomes overly stressed, it pulls on the iliotibial band. Many runners who complain of iliotibial tightness will continue to stretch the iliotibial band but fail to address the real problem – weak gluteal muscles. Try gliding your iliotibial band, TFL, quadriceps muscles and hamstrings over a foam roller to loosen them up. 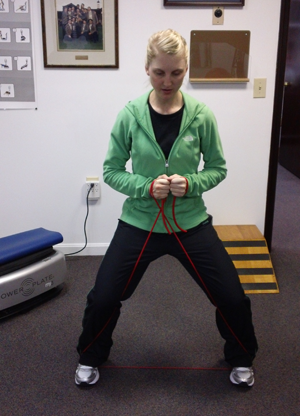 Then work on strengthening your gluteal muscles with exercises like bridges and band X walks. How do I improve hamstring flexibility? This is a question I receive on a daily basis. Muscles often tighten up because your body is trying to create stability where it is lacking. 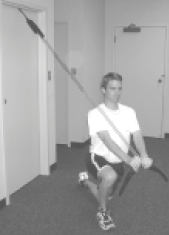 For instance, you might think your hamstrings are tight, but the underlying issue could be an unstable core. So if you simply improve the flexibility of the tight muscle, you may actually be removing your body’s point of stability. As a result, your body can become more unstable, increasing your risk of injury. If you’ve been stretching your hamstrings for years, and they are still tight, it is not a hamstring issue. Try these exercises instead. ACL injuries are becoming ridiculously common among athletes from the junior high/high school levels on through the professional levels of all sports. My personal thoughts on this issue are that they are a result of the poor training programs most of these kids go through. The act of jumping and leaving the floor is not so much the problem. But what goes up, must come down, and it’s not always pretty when it does. Landing incorrectly, with the knees in an abnormal formation, is a major cause of ACL injuries. Landing efficiently involves all the following: Landing on the balls of the feet; knees aligned with the mid to outer foot; hips are back, absorbing force; slight forward lean of the trunk with the back flat. Basically it is a good squat position! So when addressing ACL prevention, start with squat progression exercises and progress into landing progression exercises with single and double legs.